After a year of recipes often involving large amounts of sugar and typically substantial quantities of butter, I am finally writing up my first savory recipe! There’s no chocolate, butter, or added sugar to be found here but instead a simple recipe for guacamole that’s got a distinctive taste, and courtesy of one of its key ingredients holds up well in the fridge without spoiling between when you make it and when you serve it. One quick apology: the lighting in these photos is a little off. Due to scheduling constraints I had to make this guacamole at night and had only my fluorescent kitchen light to illuminate what was a very colorful preparation. 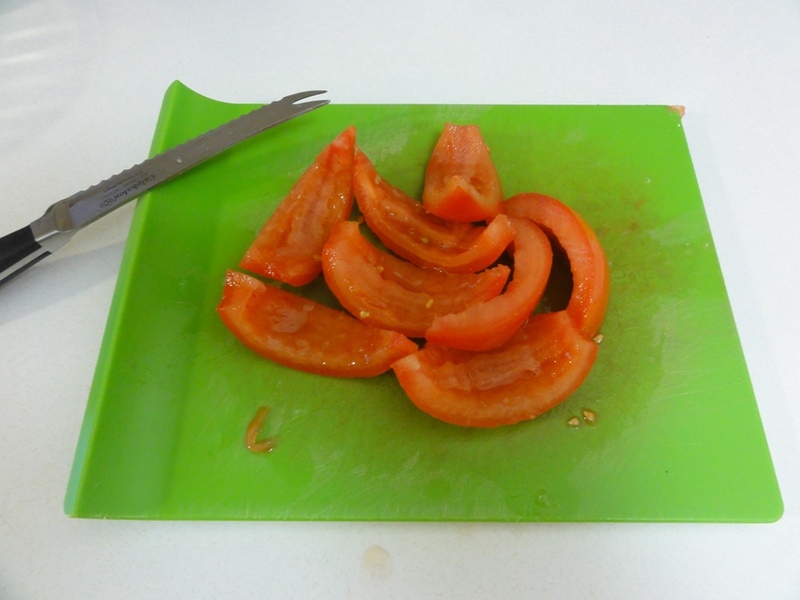 So if the shade of green of the avocados or the red of the tomatoes looks a little strange, I promise that everything was ripe and in good eating condition when I made it, but I couldn’t quite capture that reality with my camera. Now, back to the guacamole! This recipe is my least precise yet, but on account of no oven being involved it doesn’t particularly need to be. Even the seasonings don’t have to be followed to the letter; if you want it a little spicier then toss in another 1/2 tsp of chili powder and 1/4 tsp of pepper. 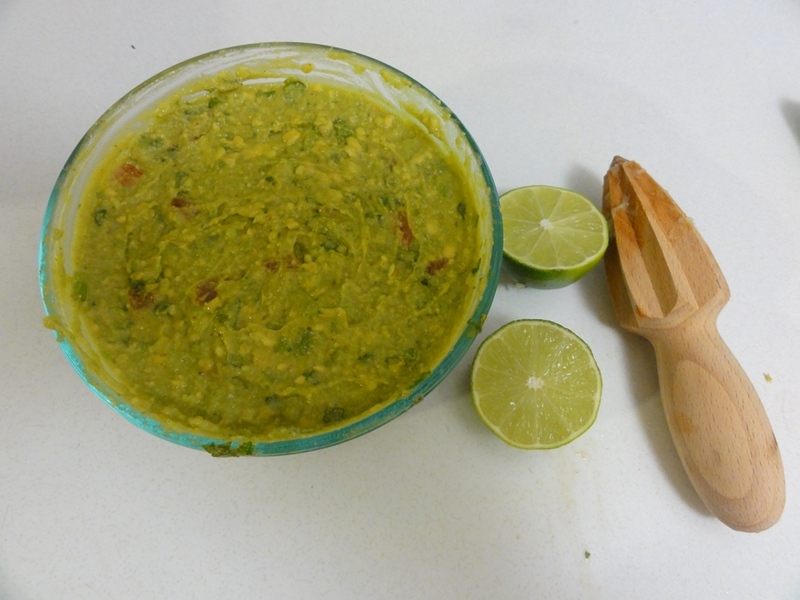 If the lime is too strong, leave half of one of the limes out; the leftover can go with the leftover cilantro into a pot of chili, which incidentally accompanies guacamole quite well. My inspiration came from two places and although this recipe only loosely resembles those sources they helped me get an idea of where to start, and I don’t want them to go without credit. Much like the avocados I used here, I mashed together Jennifer’s recipe at Once Upon a Chef for Roasted Garlic Guacamole and Kristen’s recipe at The Endless Meal for Easy Guacamole. The former gave me a guideline for proportions and the latter reminded me that for guacamole, the best way to go is to keep things simple! Both have a wealth of recipes on offer that are worth the time spent to browse through. 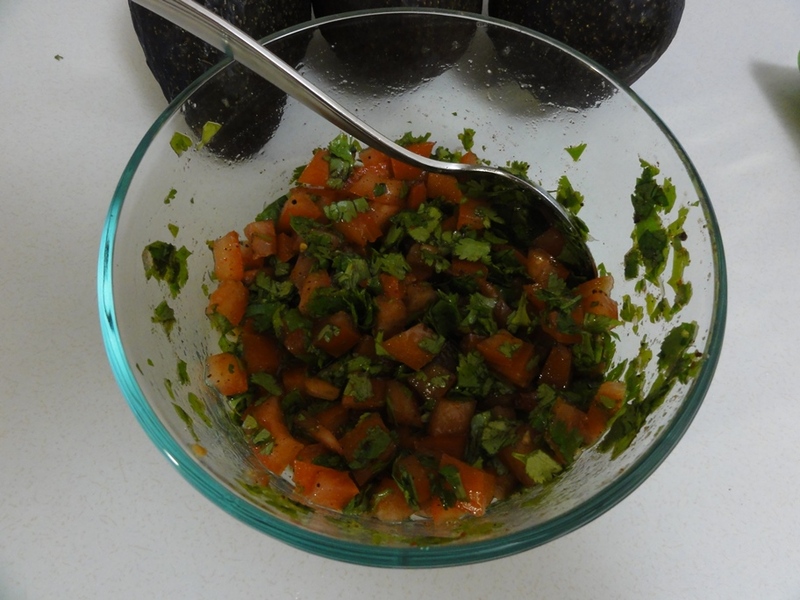 Mix the cilantro, tomato, juice from one of the limes, and seasonings, together in a bowl. 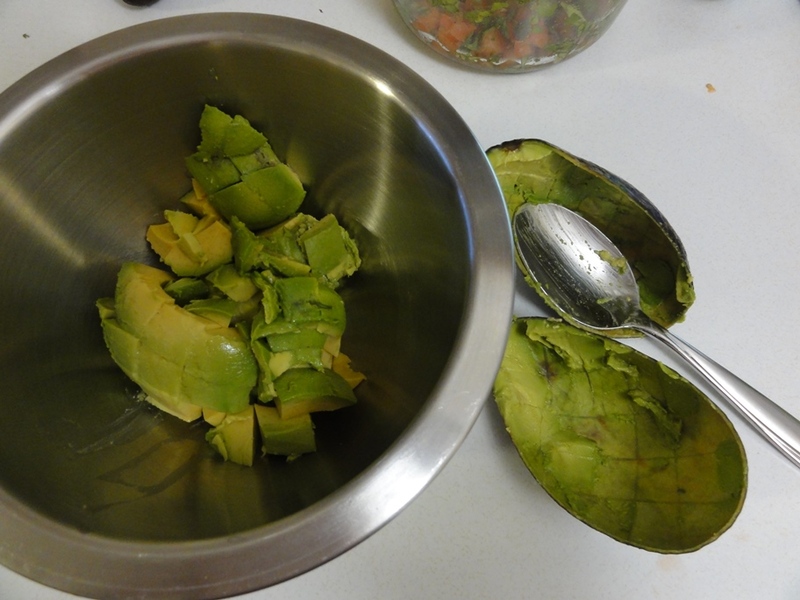 Cut the avocados in half and remove the seeds, cut squares into the flesh, and scoop it out into a separate bowl. Mash the avocado with a fork until the desired degree of chunkiness has been achieved. Add the mashed avocado to everything else, mix everything together, and level out the top. 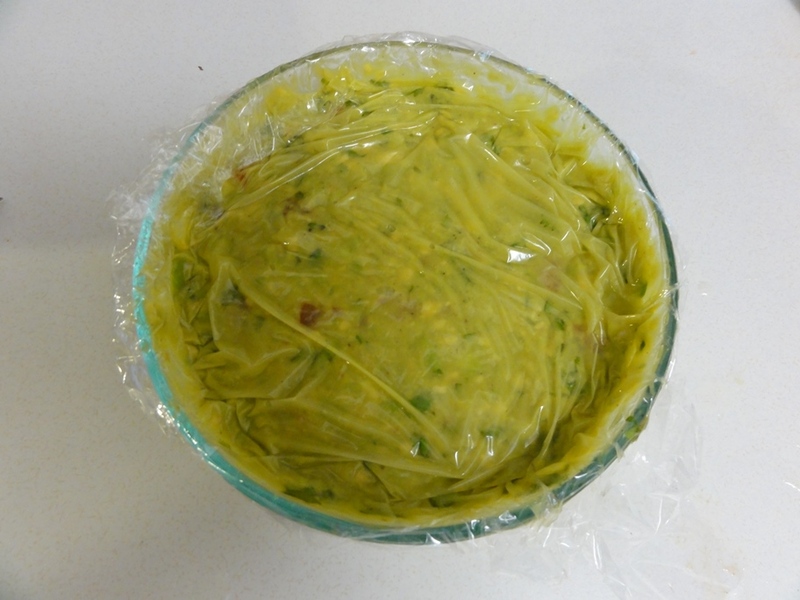 Juice the remaining lime over the guacamole and press plastic wrap over the top, pushing out any air bubbles. 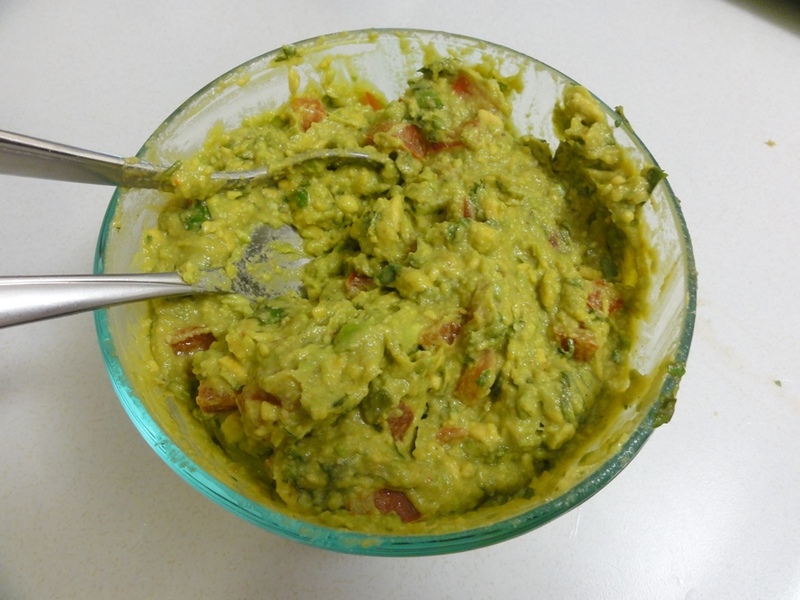 Keep in the fridge until ready to serve, and then unwrap and stir the top layer of lime juice into the guacamole. The tomato mostly adds texture to the guacamole, so if you’re not crazy about the idea of its involvement you can certainly leave it out. On that note, white corn (raw off the cob or cooked) could easily be added and so could black beans. Guacamole is wonderfully versatile! 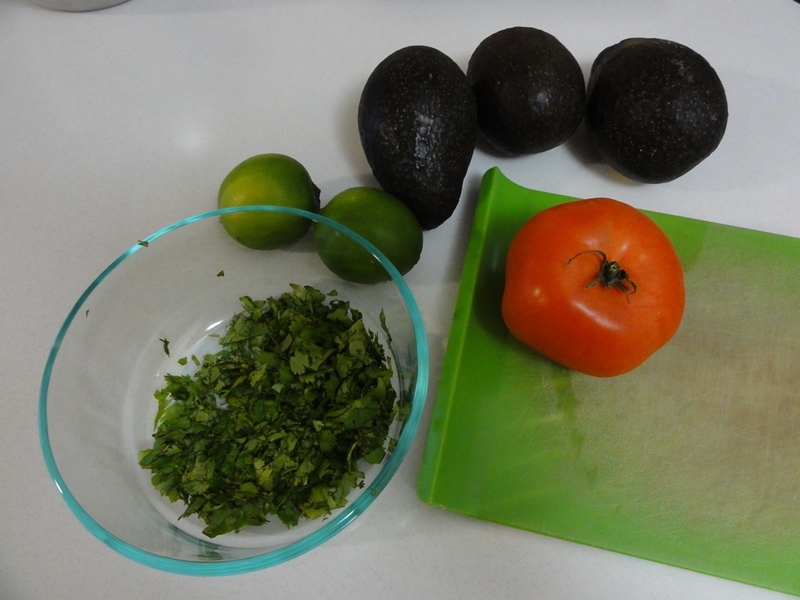 This particular combination of ingredients will not yield a spicy guacamole; the cilantro and lime are the focus of the flavor and thus things like actual jalapenos were left out because I didn’t want them to overpower the citrus flavor. 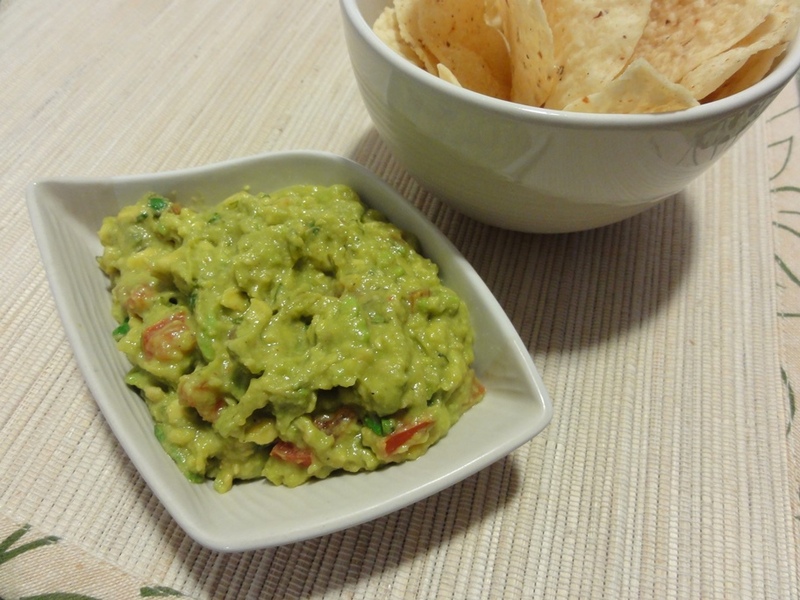 If you’re looking for spicy I’d suggest starting with the Roasted Garlic Guacamole recipe I mentioned earlier. Fresh cilantro can be tricky to come by; my supermarket doesn’t always have it but there’s a weekend farmer’s market where I can usually find it. Dried cilantro won’t do the trick because the flavor won’t come close and the texture would also be a little weird. So keep an eye out for places where you can find it fresh; and you might also find it labeled as “coriander leaves”, which are the same thing. I sometimes come across fresh cilantro paste in a squeeze tube, which I’ve used in tortilla soup to satisfactory effect (there’s another use for leftover lime and cilantro! ), and that would work here as well though you might want to start with 2 tablespoons instead of a 1/4 cup and work your way up to the desired flavor. Start with chopping up the cilantro. 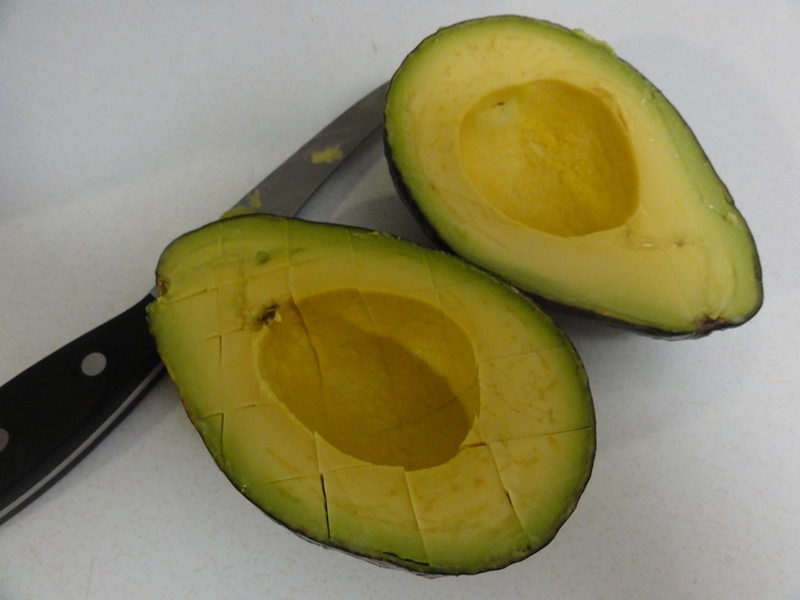 We’ll deal with the avocados last because once they’re exposed to air they’ll start to spoil, and that distinctive browning is something we want to avoid. 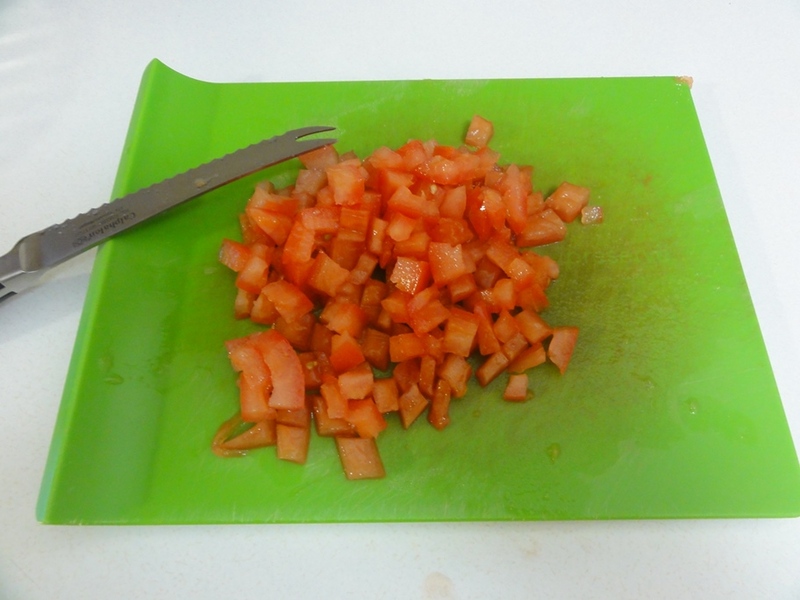 For the tomato, all we’re including in the guacamole is the outer part; the liquid in the middle and the seeds should be removed, as per the following photos. 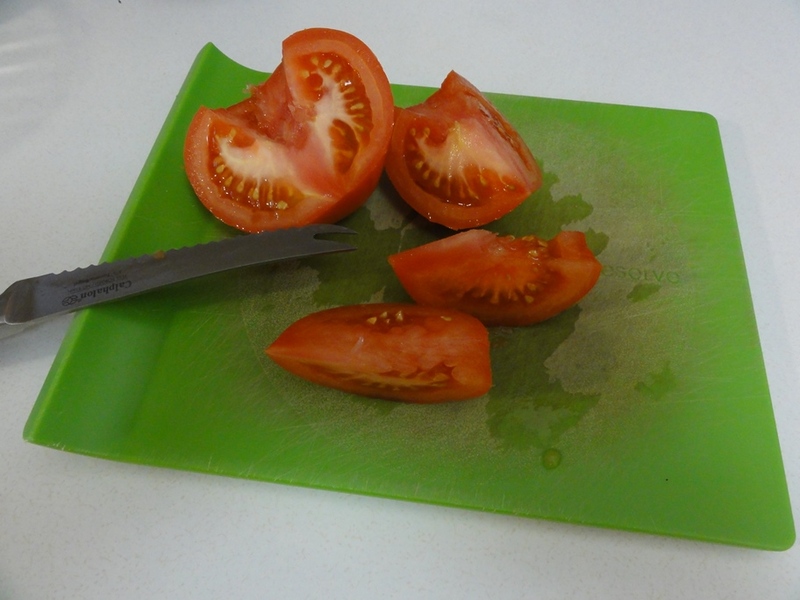 If that waste isn’t to your taste, that’s where making a pot of chili or tortilla soup alongside comes in handy because the insides of a single tomato can easily be tossed in to either without upsetting the recipe. 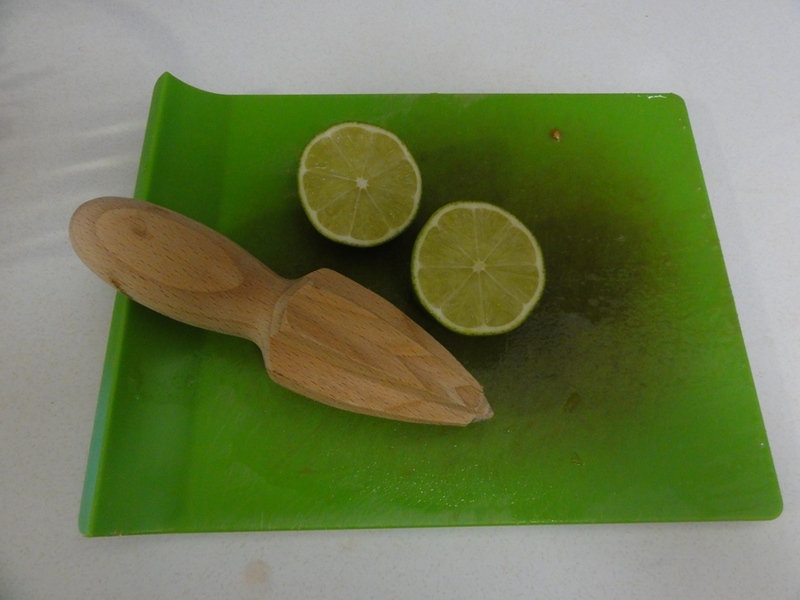 There are many ways to juice a lime, so by all means use whatever tools you’ve got on hand, even if it’s just a matter of jamming a fork in and twisting it around. A few months back I picked up the “citrus reamer” pictured below, which is a dangerous looking little tool but works great on limes, lemons, and oranges without occupying as much space in a kitchen drawer as most juicers. Again, we’re only putting one lime’s worth of juice in at this point. The juice from the second lime will act as our preservative at the end. I added the seasonings in at this point because it’s easier to mix everything together consistently before the avocados go in, and that will help to provide an even distribution throughout the finished guacamole. Now for the most important ingredient! 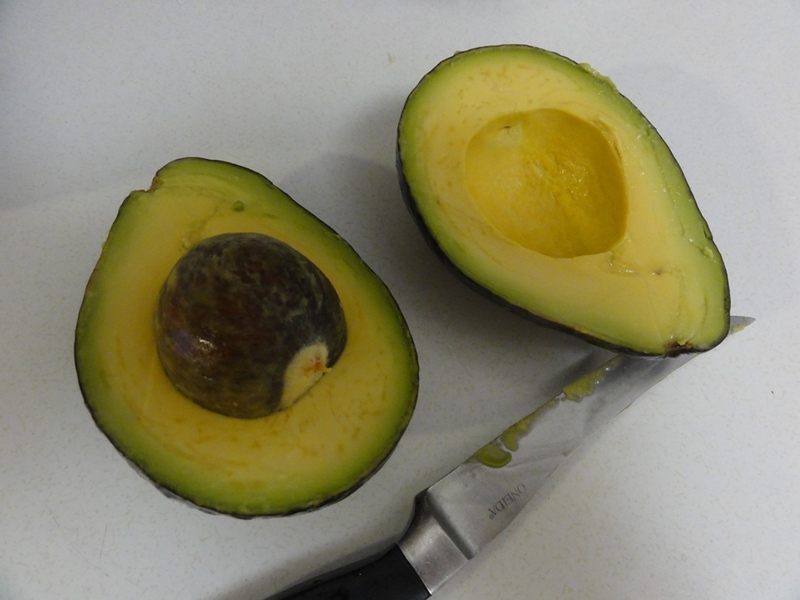 Cut the avocados in half around the seed, drop the blade of a sharp knife, preferably a heavy one, into the seed, and twist; the seed should come loose easily from a ripe avocado. Cutting lines into the avocado aids scooping everything out with a spoon. A large fork is all you need to mash up the avocado, and a slotted wooden spoon would work, too, as would a potato masher. 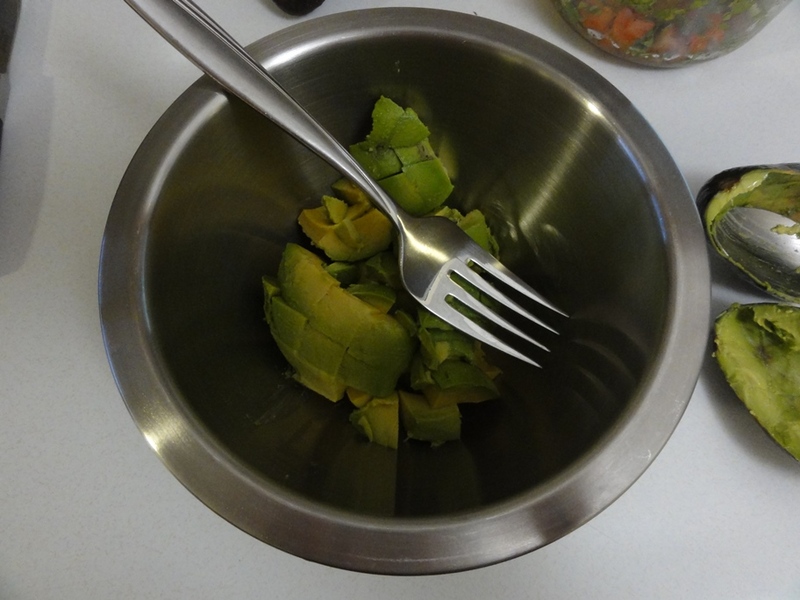 I mashed one avocado at a time because that seemed easier when using a fork and a small bowl. With a larger bowl and a potato masher you could certainly mash them all at once. 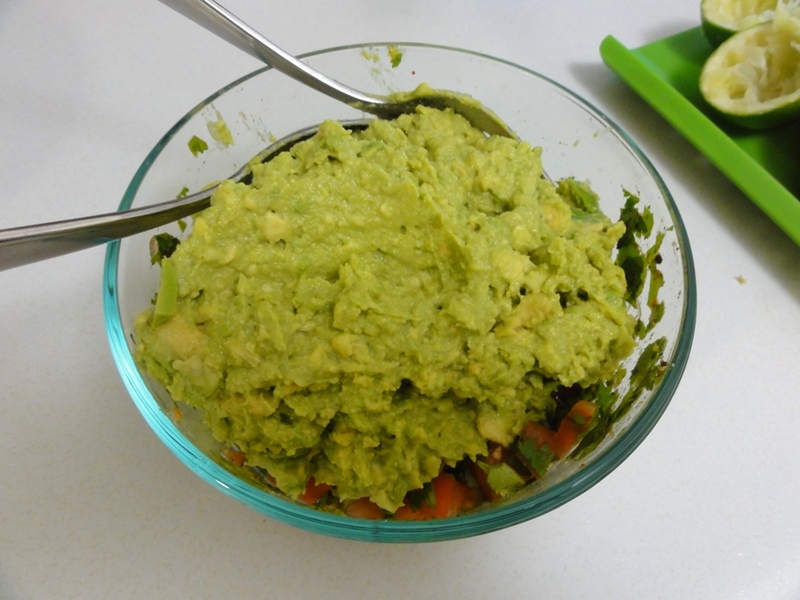 Once you’re done, toss the avocado into the other ingredients and mix it all together! 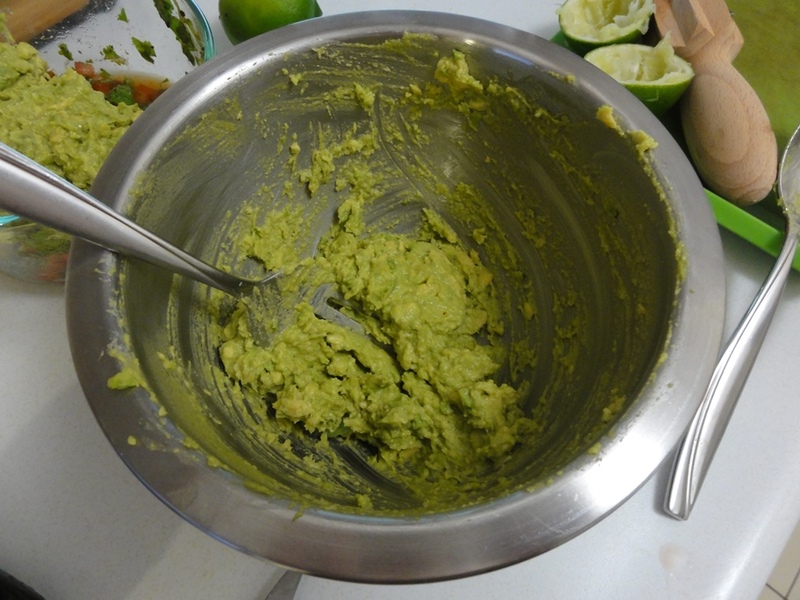 The last step serves to preserve the guacamole from going brown between when you make it and when you eat it. First you’ll want to smooth out the guacamole so that you’ve got a relatively even surface on top; this makes sealing it in with plastic wrap easier. 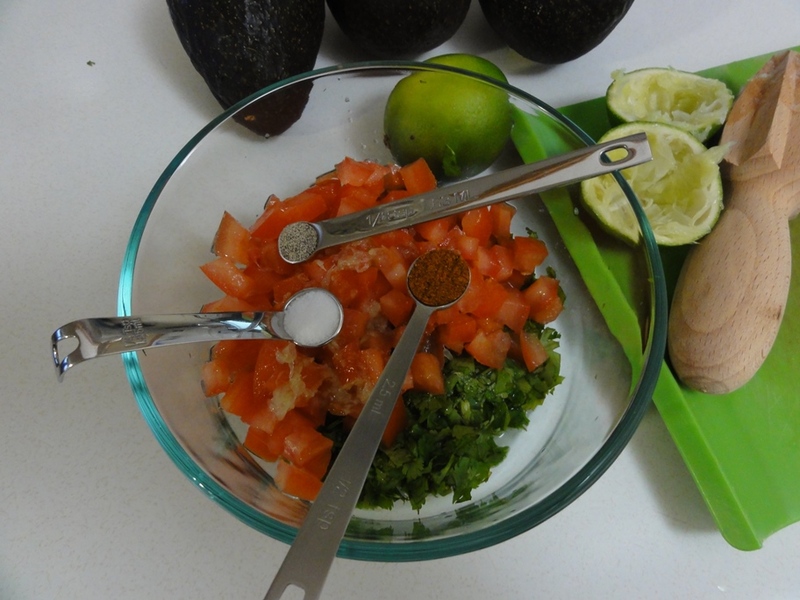 Then juice the remaining lime over the top and shuffle the bowl around to make sure the guacamole is completely covered by a layer of juice. Finally apply a layer of plastic wrap over the top, starting in the middle and working your way out to ensure there’s nothing but lime juice trapped between the plastic and the guacamole. The guacamole I made here lasted 48 hours in the fridge without even a hint of discoloring. 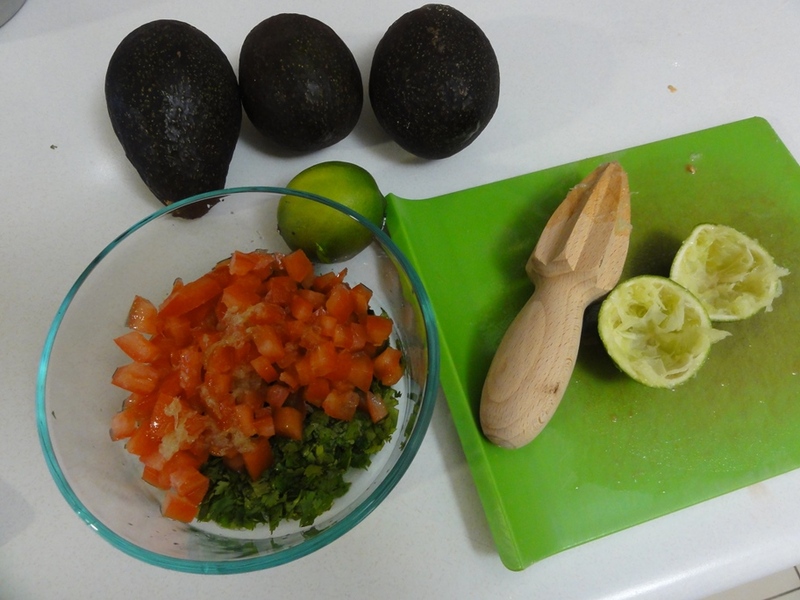 Leave the plastic wrap in place until you’re ready to serve the guacamole and then stir the top layer of lime juice in. Now it’s time to eat!